Although many home sellers consider the open house a standard practice, stats show that open houses don’t often generate an actual sale. Still, many agents find open houses offer a way to get new clients, deepen their engagement in the neighborhood, and satisfy the seller’s expectations. In this blog, you will learn three ways you can use open houses to build your business. The fact is, almost everyone who comes into an open house is a potential homebuyer. Many are looking to buy a home and may not have an agent yet. And even if they are not in the market, they may know someone who is. Maybe they plan to buy sometime in the future. This is your chance to show them that you know the neighborhood well, understand area pricing and are easy to work with. Demonstrate your leadership and marketing skills and show that you are sympathetic to the challenges of buying a home. Don’t squander any opportunity to make what could be a life-long connection with every person who walks through the door. If you’re part of the TL:DR crowd then start your seven-day free trial of AgentEDU and watch the full “How to generate leads with open houses” course. Get your name and brand out there! The first step is thinking about how to market your open house to a wider group. There are many ways to get the word out about an open house, and you should explore them all. Employ the most appropriate methods for each home’s particular circumstances. For a big impact, send two waves of direct mail postcards and emails: both before and after the open house. Send out the first email as an invitation. Let them know how to schedule a private appointment with you if they can’t make the open house. Then, position your brand in front of leads in the neighborhood who didn’t attend the open house by sending a post-open house mailer. It should say something like: “In case I missed you at the open house last Sunday, I want to make sure you have this information…” Simply putting out signs the day of the open house is not enough to maximize your opportunity. Use the postcards in conjunction with signage, flyers, print ads, Facebook ads or whatever is appropriate for the market. If you think your open house will be busy, you may want to schedule a special open house where you can spend time getting to know the neighbors. When appropriate, this kind of open house can help you grow your business and deepen your involvement in the neighborhood. Consider holding a “neighbor’s only” preview a few days before the public open house. This is a great way to get to know neighbors’ concerns, allay any fears they have, and enlist them to help you find suitable buyers. It also gets the “curious lookers” out of the way early on, allowing you to spend more time with serious buyers who attend the weekend open house. 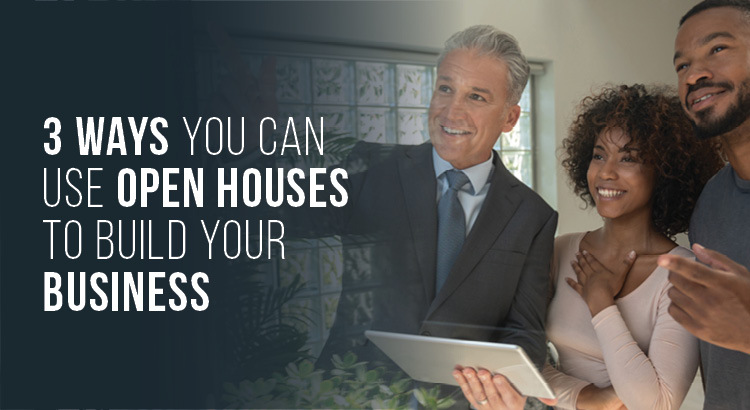 If you find yourself without any listings suited to open houses, you can build your business by offering to man the open houses of other agents. Open houses can be a great way for agents to jumpstart business activity. Whether you are a new agent or just want some new business, helping other agents with their open houses can give you practice with potential buyers while you learn about the local market. If you are new to an area or a specialty, manning an open house can give you the experience and confidence to move forward. It typically works like this: An agent who is looking to gain experience lets their managing broker know that they are willing to man open houses, and the managing broker can put the word out. Some agents may choose to offer their assistance directly to experienced agents who may be too busy to man their own open houses. It’s a mutually beneficial arrangement: Experienced agents get help with the details of their open house, allowing them to concentrate on other priorities or listings. And the more junior agent gets to attach his or her name to a more experienced agent while getting real-life experience. There is often a daily stipend or a referral fee if that open house leads to a sale. Either way, it’s smart to man the open houses of agents who do a good job of marketing the homes. If there has been no marketing and the agent is just holding an open house to appease the sellers, it may be less fruitful. If this happens to you, make sure any potential buyers who attend the open house know that you’re hosting it on behalf of the seller’s agent.